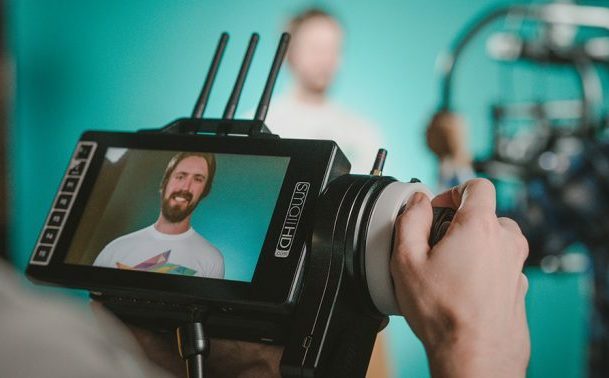 Teradek and SmallHD teamed up recently in a combined effort to “cut the cord” sort of speak with their latest collaboration – the super-bright 7″ SmallHD 703 Bolt wireless monitor. The new SmallHD 703 Bolt is a match made in heaven between the two companies, which were able to create a 3,000 nit, daylight viewable, 7-inch beast of a monitor that has a built-in wireless receiver; 5Ghz wireless networks are supported and as long as you are within a 300 feet line-of-sight range you’ll get an uninterrupted wireless feed. The SmallHD 703 Bolt is compatible with the Teradek Bolt 500, 1000, and 3000 transmitters, and also features a rugged antenna guard to protect your receiver as director’s monitors often get banged up on set, however the milled aluminium frame and bonded glass screen should be able to do a good job of minimizing such damage. At BSC Expo 2018, I met up with Sebastian from Holdan UK, the distributors for SmallHD and Teradek, among many other brands, who showed me some of the awesome features of the new SmallHD 703 Bolt they launched at the show for the UK and European market. Available power options include Anton Bauer or V-mount, via battery plates; the 703 Bolt will also ship with a D-Tap to LEMO power cable and a couple of screen protectors. Shipping commences end of the month, and you can learn more about it by visiting Holdan’s website here or SmallHD.com.